2. Eyeshadow: This is one makeup item for which you actually have MILLIONS of options available. To keep you sane, we have listed the ones easily available easily even online in India and which are very good in pigmentation and stays for long. Check out palettes from Makeup Revolution for a huge variety. Stock one in neutrals (both shimmer and matte shades) and one in bold colors. Two should be sufficient. If you are not an eyeshadow person in daily life, you can try out Coloressense Mono eyeshadows. They are INTENSELY pigmented (Check review HERE). 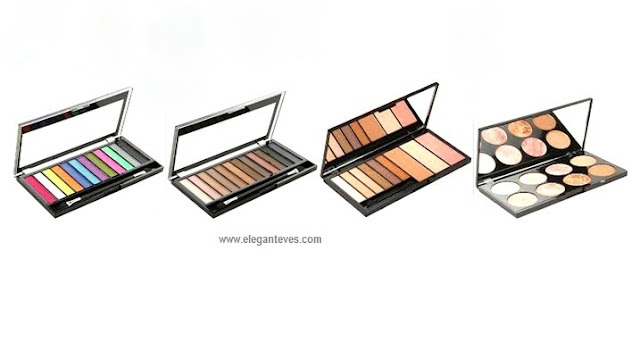 You can also opt for the blush-highlighting-eyeshadow palettes from Makeup Revolution available on Jabong.com. These would be cost effective as well. 3. 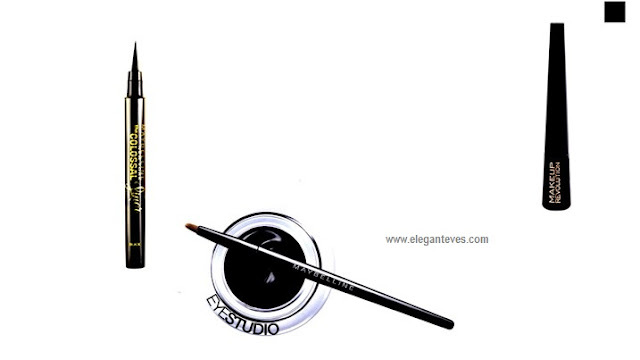 Eyeliner: A jet black eyeliner should be in the vanity of EVERY Indian bride. We have listed our three favourites: Maybelline Colossal Liner (A precise felt tip pen for ease of application with jet black liquid liner for that perfect winged line), Makeup Revolution’s Amazing Black eyeliner (read review HERE) and Maybelline gel eyeliner (for that ultra intense and non-smudging look; can be doubled up as kajal too). Elegant Eves Suggests: Do not skip on this essential. Perfectly defined eyes in pictures need that black eyeliner. 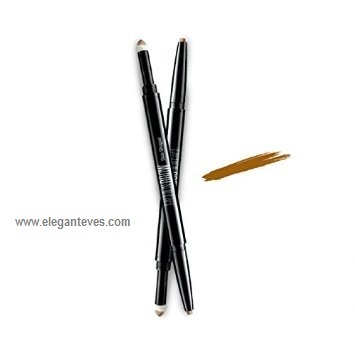 Maybelline Colossal pen eyeliner will be perfect for the other functions in wedding too. 4. Kajal/Kohl: This is one ancient beauty item which still holds a special place in our hearts. It is probably the first “makeup” thing we used. We have chosen three kajals available in Indian market which gives intense pigmentation, stays long and is comparatively smudge free. 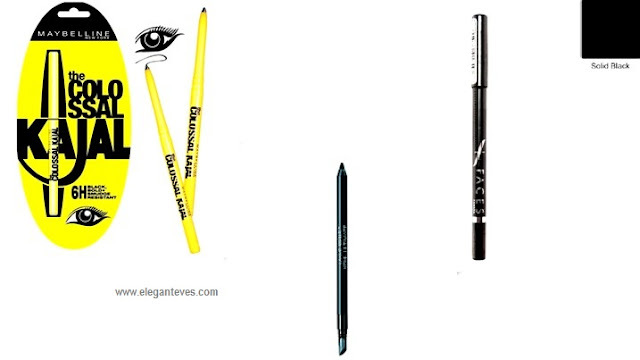 Maybelline Colossal, Lakme Absolute Kohl and Faces Canada eye pencil in Solid Black. Colorbar I-glide pencils are very good too. 5. 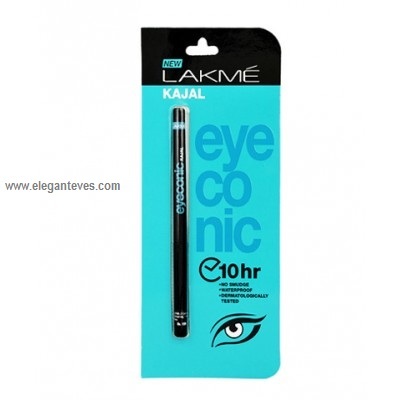 Colored eye pencils/ Kohls: If you are one of those fuss-free brides who do not want the hassle of eyeshadows during each and every function of wedding, colored eye pencils should keep you sorted J Choose an emerald green, a midnight blue and a deep purple from Lakme eyeconic pencils, Colorbar i-Glide pencils and Faces Canada. These three colors suit almost every Indian complexion beautifully. They can be used on lower lashline for that pop of color or smudged on upper lashline for that eyeshadow effect. 6. Mascara: Finally the magic wand which COMPLETES any eye makeup J A bride without those fluttering eyelashes is somehow incomplete ;) I am personally not a fan of false eyelashes and that’s why I prefer mascaras which give volume, length and curl all in one. Two of my favourite mascaras are Rimmel London’s Lash Flirt Mascara (Read review here) and L’oreal Million Lashes mascara (Used on both wedding and reception). 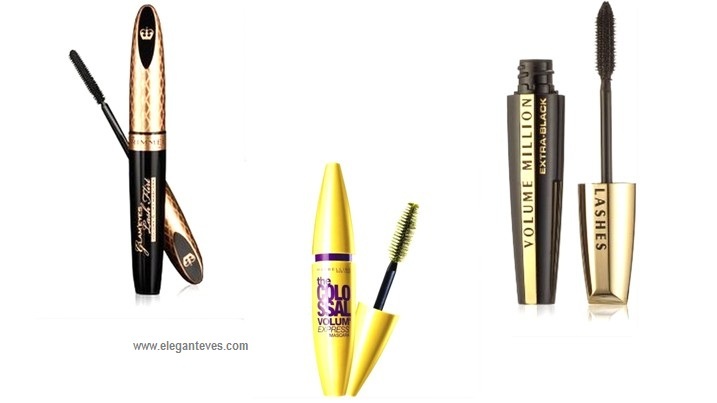 Another personal favourite is the Maybelline Colossal Volume express mascara. All of these come well under Rs.1000.